Do you love art, but dislike visiting museums? 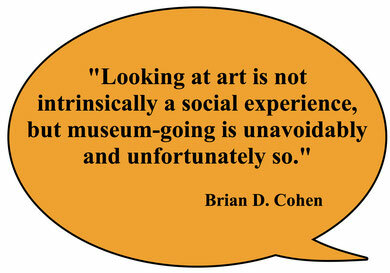 If yes, you may enjoy Brian Cohen's article, “How to Visit a Museum,” a comical critique of museum practices. While many of Cohen's recommendations focus on a need for visitor solitude, he realizes that museum-going is “unavoidably and unfortunately” a social experience. His recommendation to avoid the museum guards is one I disagree with. Guards are observers who often have interesting opinions about the collections. Read the article in The Huffington Post here.